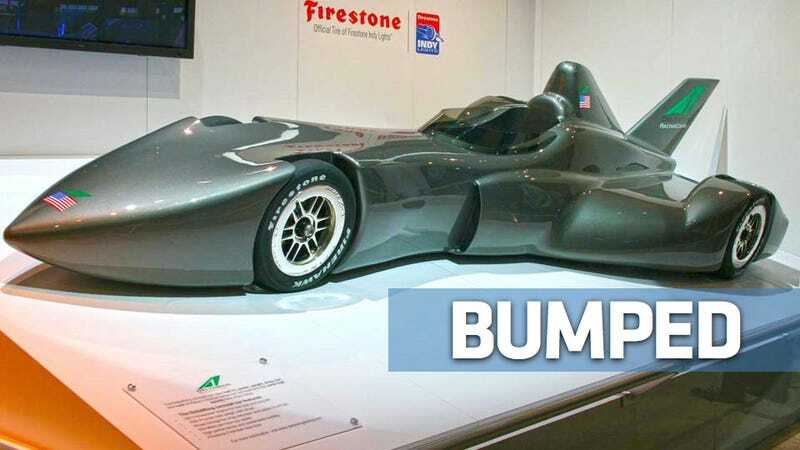 This weekend's Indianapolis 500 will be the last before new cars from chassis maker Dallara debut next year — but as Racecar Engineering's Sam Collins shows, the Indy Racing League missed a chance for something truly groundbreaking. — Ed. As Dallara's two full-scale 2012 Indycar concepts were rolled out recently, it was the end of a long and controversial road which saw a number of manufacturers offer all new cars for the 500-mile sweepstakes. Some constructors and most fans wanted open competition but the men of ICONIC [the committee that chose the designs] decided that they would stick with a spec chassis built by current supplier Dallara and open up some portions of the bodywork for development. This meant that some exciting and interesting concepts were left on the drawing board, despite a number of them featuring superb ideas. This feature takes a look through what the new IndyCars could have looked like if ICONIC had been a little braver. One of two very serious rivals to Dallara Lola proposed an all-new car which could accept a variety of engine and also be used in Indy Lights. At the heart of Lola's presentation to the IRL Board was a dual body style approach. This concept would provide two ready-to-race aero performance balanced IndyCars that could compete even safer side by side and very close behind one another on all circuits. This would provide a unique focus for drivers, teams and fans alike without technical compromise or advantage and in addition would accommodate a dual engine supply situation if required. The proposed Lola Indycar for 2012 focused on several key areas: safety, efficiency, engine adaptability, weight reduction (proposed 1380 lbs. vs. the current 1540 lbs. ), pleasing aesthetics with good sponsor exposure and a concentrated evaluation on significantly improving overtaking. As part of the rigorous technical studies by Lola engineers, an entire range of futuristic concept cars were explored. While these proved technically interesting and on the wish list of the special projects team, some of these options will be deferred, but retained, as a next iteration option. Lola-supported university projects that are now using recycled materials continues to be of great interest. "The majority of the downforce will be generated by a large central underbody, this allows us to reduce the size of the front and rear wings creating downforce, which is less susceptible to variations when following another car closely" explained a Lola spokesperson at the launch of the concept. Lola addressed the visual variety portion of the bid by offering two distinct bodies with equal aerodynamic performance, something ICONIC is not doing with the optional aerokits it is introducing in 2012. "The main reason for choosing one Lola bodywork configuration over the other would be a preference for the visual variety. How it will work practically is that Lola will match the configurations in the wind tunnel across the entire ride height range to ensure parity. It is most probable that the team's engineers will try very hard to get an advantage from one kit or the other, but there will be means of policing that action." The Lola design could also be adapted to Indy Lights spec, not something the Indycar organisers asked for but a valid idea as Lola explain the logic. "To have the same chassis for both series will also ensure driver safety for the feeder series. The common chassis idea was creative thinking at Lola and generates a cost-effective solution in the current economic climate and secondly in trying to assist the teams in terms of pragmatic racing in two series that run on the same bill." Despite Lola having great experience of Indy racing, a decent concept, a full design and production capability and a proven track record in the USA arch rivals Dallara were chosen over the English firm. Some said that the Lola design was too conservative and other said it looked too much like an uprated champ car. The car got as far as a wind tunnel model but no further. Dallara and Lola were two companies with a design and construction capability in-house, a third Swift Engineering came from the left field with an unusual design concept packed with innovative features. Swift had good recent form with supplying interesting looking spec racers with the Formula Nippon chassis it had developed a couple of years earlier. Swift's concept #70 was the last evolution concept and incorporates aspects of the six previously launched concepts Swift has designed over nine months. Safety was also a very important consideration in the design process and the concept incorporates features resolving many issues the current chassis inherently (and recently) demonstrates. Despite some great ideas and a great result from the fans,d the Swift concept was not chosen. Paddock patter claims this may be because Swift refused to move production to Indiana, choosing to build and supply the cars from its California base. The obvious feature of the BAT project is the experience of its partners who, over a 16-year period, were among the most influential of Indy car designers. The goal has been to produce the safest cockpit available, while at the same time positioning the driver in such a way that he can drive the car in a more aggressive fashion. The design features the strength to sustain minor knocks, as well as stable aerodynamics to allow the cars to run closer together. The wheels are protected from interlocking, although the design still retains a Coke bottle shape in the sidepods. The airflow path is directed underneath what [designer Bruce] Ashmore describes as ‘sponsor friendly' rear decking and towards the center of the car, in order to facilitate overtaking manoeuvres. The downforce, meanwhile, is generated more from the stable centre body profile rather than the turbulent sensitive front and rear wings as on current single-seater designs. The BAT design is one of the smoother flowing of the bids. Take Ashmore's 1990 Indianapolis 500-winning design, move forward to the thinking of 20 years later and perhaps this is it. All the wheels are well protected, the forward ones between the end plates of the sculptured wings and a separate guard that protrudes from the front of the sidepod. The rear is enclosed front and back by the rounded bodywork, from which flows the integrated rear wing. But the concept was not popular with fans, and ultimately the BAT was not successful. Ashmore's designs continue to compete in USAC Gold Crown racing. Easily the most radical concept of all was the Delta Wing. The story of Delta Wing was not simply about its futuristic design, whether it looks like "Spirit of America" or whether, with its narrow front end, it will corner effectively. It is more about new philosophies designed to make IndyCar racing more relevant to the automotive industry and less harmful to the planet, while also aiding a sport, arguably in crisis, by distancing it from the disease that is spec racing. "The car is only part of the deal," designer Ben Bowlby told Racecar Engineering. The unveiling of the project at the Chicago Auto Show indicated the thinking behind the first of these with a design that can reduce the amount of power required to produce 235 mph lap speeds on longer oval tracks and, therefore, the amount of fuel needed, in line with evolving road car trends. Discussions between Bowlby and team owner, Chip Ganassi, about how they could halt the sport's stagnation began in August 2008. "What we wanted was not another one-make car," says Bowlby. ‘We needed something that could be made more marketable to the auto industry and to the consumer. Also, how did we engage the youth and how did we make it interesting to more than just the race fan? We felt that being highly efficient, using powertrains that were much more akin to those fitted to road cars, was a goal we should pursue. The current Indy car is the refinement of something that has been around for 50 years, but it has very little relevance to anyone other than a diehard race fan." "It was almost design by paranoia," says Ganassi, referring to the fact that the team asked itself "about 50 questions. We've had bigger engines, we've had smaller engines, we've had bigger wheels, we've had smaller wheels. We've done everything you can possibly do and we just think if you had a clean sheet of paper, what would you start with? We think this would be it." In seeking to reduce the aerodynamic drag by more than half, Bowlby recognised that 54 per cent of the drag of an Indy car came from the exposed, rotating wheels. The obvious solution seemed to fair them in. "Enclosing them, though, created a sportscar which was not the identity we wanted, and it did not get rid of that much drag." The front wheels are close together –- the front track is just 24 inches –- and tucked well into the bodywork. Originally, even the tops of the tires were to have been enclosed but this would not have suited Firestone, as this would have impeded taking temperatures and examining the tire surface. The layout of the car can also accommodate multiple engine suppliers. Its engine cradle can be used for a variety of shapes, configurations and capacities of powertrain as a non-stressed, non-structural element of the chassis. This means the powertrain does not have to perform two functions and so reduces the cost of developing the engine. Being isolation mounted will assist with the issue of vibration and harshness being transmitted to the rest of the chassis, which in turn will mean a major weight saving – on most race cars components are heavy just to survive the vibration. Without driver, Delta Wing will weigh just over 800 lbs, meaning far less power is required to achieve the desired power to weight ratio. The chassis itself is to be made of advanced material combinations – unidirectional carbon and a core material of a recyclable polypropylene matrix. These are low-cost and have a high performance, particularly from an energy management standpoint. A price of just $600,000, including the engine, is being predicted so it is perhaps not surprising that the vast number of team owners seem to be behind the project. Delta Wing does not see itself as a manufacturer, although it will be responsible for the production of the prototype. Bowlby is known as a free-thinker and the design probably would have worked — his open source development concept went down well with the industry — but was the design just too extreme? Plans to build a running prototype continue and Delta Wing is not quite finished yet. The last Champ Car had an oval track body mocked up on the wind tunnel model to give an impression of how it would look in Indy 500 trim. Had the design been taken up along with the older still-born Lola concept IndyCar then maybe the 2012 program and ICONIC would never have happened. This story originally appeared on Racecar Engineering on May 18, 2011, and was republished with permission.